If Cambodian leaders can put aside personal view, and put the interest of the nation first, the recommendation of Special Rapporteur Surya Subedi is the win win approach for this nation. At the moment, we can see clearly that the powerful ruling party is playing procrastinating game and no political will of reform or following the recommendation of the Special Rapporteur at all. This election is a gross loss at its legitimacy as NEC has been increasingly summing up bad credit among the electorates and international communities. Hence, this body has been fully protected by the ruling party. We can see the mass and the will of the Cambodian electorates are the winner over this loser system. With this imbalanced existing scenario sufficiently create fragile bottom up power and can lead to destruction and instability of this nation. Political scientists can not pre-calculate on the magnitude of crisis caused by this ineffective bridge: the strong bottom up power with the upper ineffective system. If crisis occurred, the CNRP is not the responsible party while this party is working hard to accommodate itself with the bottom up power and to organize their spirit within an order movement. But if the institution power and its system is continuing to ignore this power, or without comprehending this power, or working to cope this power by force; the unprecedented crisis is tangibly intolerable. By national and international law, CNRP has relevant demand on the creation of a credential commission to investigate the election irregularities as well as to pave way for future confidence of this national bridging committee. There is a professional move by changing from proposing UNs as the referee to be an investigative member. I think this is a provision to avoid tension which I don’t see from another side. In contrast, the mobilization of the military with heavy ammunition is a sign of doing a job that is not described in the job description and it is a sign of tension. At the meantime, Cambodian people are learning the value of democracy and we can testify this by the ballots they voted on July 28, 2013; but the ruling party is still delivering the same messages, the messages of using armed force for national security, unity and sovereignty. This message is again stated by government spokesperson with Hello VOA today (August 12, 2013). 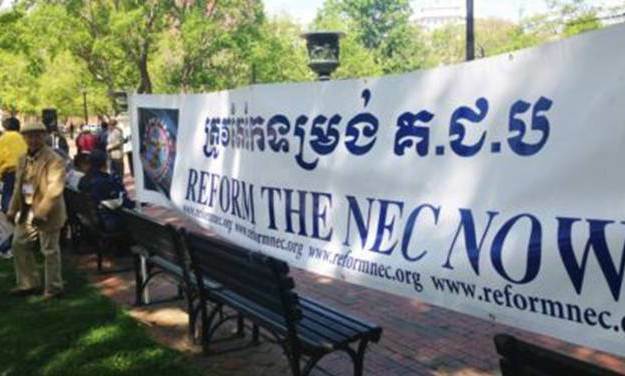 While NEC was heavily criticized since its inception and it is requested for reform by both Cambodian people and the international communities, the ruling party is not only being so protective to the NEC but also exposing itself as the secure shield to protect this body at all cost. It is time for the ruling party to use the armed force in the way of democracy principle and stop protecting the rotten fish in order to freshen the whole fish and embark Cambodia in a safe haven. Politically, legally and wishingfully, could we reach that stage of NEC reform any time soon? 65. The National Election Committee should have independent and autonomous status in the constitutional and legal structure of Cambodia, with its own independent budget allocated by the parliament. The president and members of the Committee should be drawn from a pool of retired senior judges, senior and distinguished members of the Cambodian bar and senior professors of law, politics and public administration. 66. There should be consensus among the major political parties represented in the parliament on the appointment of the president and members of the National Election Committee and the provincial election committees. 67. The Government should initiate a process to amend article 13 (new) (2) of the law concerning the National Election Committee and other relevant articles to ensure that, within the composition of election bodies of all levels, there is balanced representation of all political parties with representation in the National Assembly. 68. The president and members of the National Election Committee and the provincial election committees should be appointed for a fixed term and have security of tenure. They should be barred from holding positions in political parties during and up to two years after the expiry of their terms of office. 69. The Special Rapporteur has reviewed the mechanism to resolve electoral disputes and is of the view that it should be improved. Currently, the election officials themselves are entrusted with the task of resolving preliminary election disputes. 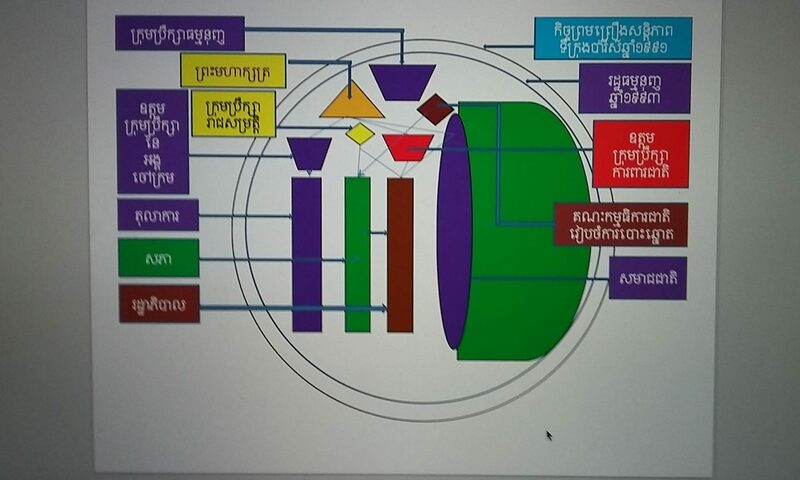 To increase the confidence of all political parties in the election process, there is a need to amend the law and to create another institution, such as a special election tribunal or election court within the judicial structure of Cambodia or as a special election tribunal within the National Constitutional Council to resolve election-related disputes, rather than using the National Election Committee itself to do so. 70. All major political parties should have fair and equal access to the mass media to convey their messages to the electorate. This should include the opportunity to broadcast their message during primetime viewing hours. The way forward could be to establish an independent committee on the management and use of State-run television and radio stations, allowing all major political parties that are represented in the National Assembly to fully use the stations until the day of election campaign on an equal footing. 71. Another issue is the use of State resources, including the time of Government employees, motor vehicles and materials, by political parties during their campaigning. The Government must ensure that all civil servants, police and military personnel do not participate in political activities or use Government resources while working in their official capacities, and that neutrality is paramount. 72. For the elections to be credible, all opposition parties must be free to organize and campaign without fear and hindrance. Elections are not only about polling day, but also the overall human rights context in Cambodia. The Special Rapporteur has been informed of cases of harassment and intimidation of people attending party political meetings of opposition parties by Government officials and the secret police. The Government must therefore ensure that opposition parties are free to carry out their political activities without harassment and intimidation not only around the dates of elections but also in the lead-up to the elections and throughout the parliamentary cycle. 73. There should be a more effective, impartial and non-discriminatory procedure for the registration of voters in Cambodia. Accordingly, the Government should expeditiously provide necessary documents, Khmer nationality identity cards, passports and other necessary civil registration documents to all citizens for nominal fees and should reregister voters using the data from those cards as a basis to establish a new electoral roll. 74. Any Cambodian citizen eligible to vote should be entitled to request registration with the electoral and/or local authorities at any point during the year. Once he or she is issued with an identification card, that card should be valid for life, unless a change in personal circumstances warrants amendment. 75. The commune council elections in June 2012 identified continuing problems with voter identity documents, especially the issuance and use of fraudulent documents (the now-abolished form 1018). The National Election Committee should review the process of issuing such documents to ensure that the system is not abused by political parties in their favour and that there are no electoral malpractices. 76. The National Election Committee should devise special measures to ensure that those who are homeless or have been recently evicted from their land are not disenfranchised in the forthcoming elections. 77. To hold free and fair elections, the entire political environment should be free and conducive to exercising the rights and freedoms guaranteed in the Constitution and the international human rights treaties ratified by Cambodia. The Government should therefore ensure that all persons are able to exercise their rights to freedom of expression, assembly and association. 78. The electoral process, including the voter registration process, and the manner in which electoral disputes are dealt with should be transparent and conform to international standards. For example, the National Electoral Committee should make public the names of polling officers and make the voter list available to candidates from all political parties upon request, affording them an opportunity to challenge the fraudulent inclusion of names on the list. 79. The National Electoral Committee should appoint professional election administrators to replace village chiefs during voter registration and on election day and bring all commune election officers and processes under its own stricter supervision mechanism. 80. The current law, which requires a person to be nominated to stand for election by a political party, should be amended to make it possible for independent candidates to stand in the national elections. 81. Since Cambodia allows dual citizenship, the National Election Committee should make it possible for Cambodians living abroad to exercise their voting rights, at least in the countries where it has diplomatic and/or consular representation, as done by many other countries. 82. Lastly, the Special Rapporteur is aware of the situation of Sam Rainsy, the leader of the Sam Rainsy Party. He has been convicted on charges that are allegedly politically motivated. A political solution should be found to enable him, as the leader of the opposition, to play a full role in Cambodian politics. The Special Rapporteur believes that a concerted effort by the ruling and opposition parties towards reconciliation is in the interests of stronger and deeper democratization of Cambodia. This is especially so in the lead-up to the national assembly elections. For longer-term peace and prosperity in Cambodia, there should be a level playing field for all political parties to compete on an equal footing. The people should have faith in the system of governance in the country and in periodic elections, which are at the core of democracy.